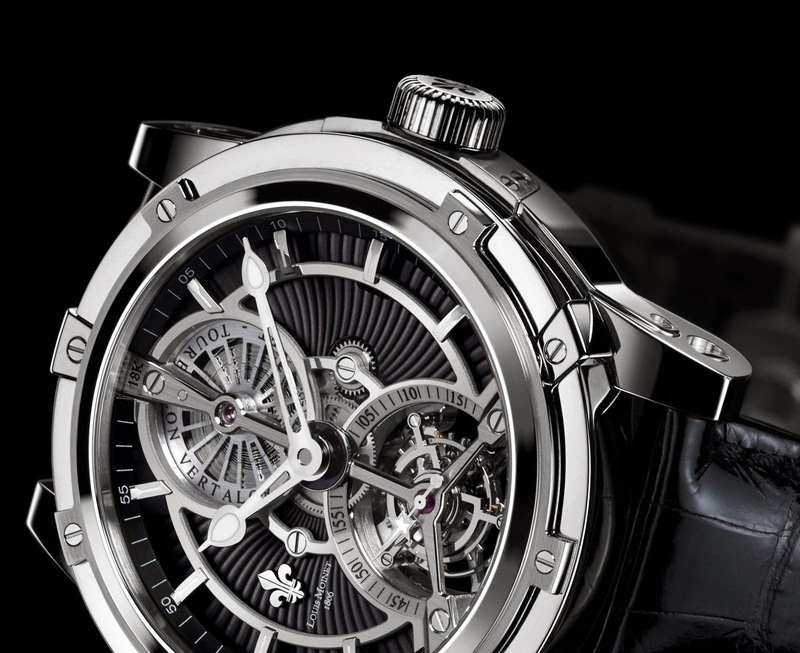 Inspired to the work and aesthetics of famous French watchmaker, sculptor and painter Louis Moinet, the eponymous independent company started ten years ago in Saint-Blaise (Canton of Neuchâtel) celebrates the special anniversary with the Vertalor Tourbillon, a remarkable timepiece featuring a tourbillon with a cage hanging from a three-armed bridge made from solid gold. Positioned at 6 o’clock, this beautiful tourbillon performs one full rotation every 60 seconds and features a new hand whose luminous star-shaped tip evokes Louis Moinet’s design for the Julius Caesar clock (1825). At 12 o’clock, the theme of suspension continues with the barrel, whose cover also hangs from a gold bridge. The dial is decorated with a Côtes du Jura pattern and leaves the winding cog visible between the barrel and the tourbillon. A fragment of moon meteorite adorns the centre of the dial, at the centre of the “Gouttes de Rosée” (Dew Drop) open-worked hands. 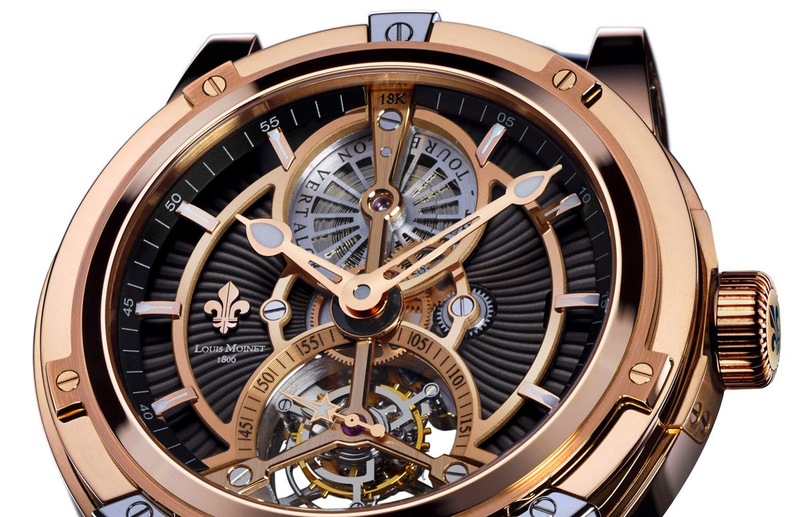 The Louis Moinet Vertalor Tourbillon is available in two limited editions of 28 pieces each in pink gold (ref. LM-35.70.50) or in white gold (ref. LM-37.50.55). The elaborated 47mm-diameter case, a distinctive trait of all Louis Moinet timepieces, is composed of no less than 59 parts and protects the hand wound movement beating at 21,600 vibrations per hour and offering a three-day power reserve. 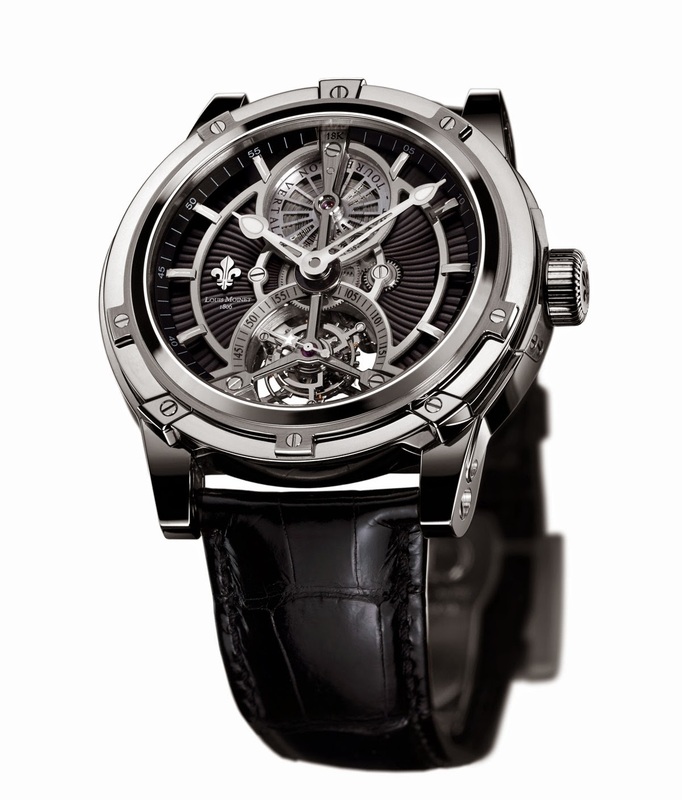 Louis Moinet Vertalor Tourbillon. Inspired to the work of famous French watchmaker, sculptor and painter Louis Moinet, the eponymous independent company started ten years ago in Saint-Blaise (Canton of Neuchâtel) celebrates the special anniversary with the Vertalor Tourbillon, a remarkable timepiece with tourbillon. 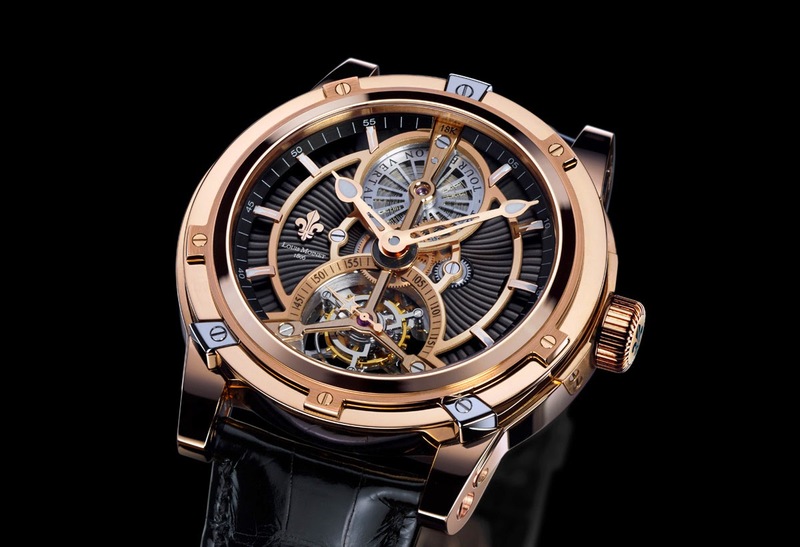 The Louis Moinet Vertalor Tourbillon is available in two limited editions of 28 pieces each in pink gold (ref. LM-35.70.50) or in white gold (ref. LM-37.50.55).